Key Word Sign is a simplified way of using manual sign. 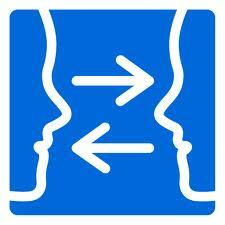 Key Word Sign uses the same signs as people who are deaf but it is used with people who can hear. It is often recommended for young children who are slow to develop speech. It may also be suggested for older children and adults who have little or no speech or speech that is difficult to understand. The most important question is why we want to use Key Word Sign with a particular person. Encourage the person to use the Key Word Signs that they know. No one can be harmed by seeing too many signs – seeing and using Key Word Sign helps others to become better communicators. Find out about Key Word Sign workshops by visiting the Key Word Sign website in your state. This entry was posted in Uncategorized on August 29, 2014 by crcscope. The Frankston Visitor Information Centre supports tourism in the Frankston and Mornington Peninsula region. Over 95,000 people from all parts of Australia and overseas come into the Centre each year. The Centre is run by 4 paid staff (1 full time and 3 part-time) and 32 volunteers. The Centre has a paid up membership of 260. Members businesses are promoted and advertised by displaying their goods or brochures at the Centre. The Frankston Visitor Information Centre has won both the RACV Victorian Tourism Award and the Australian Tourism Award for 2012 and 2013. Natalie Nash, the Visitor Information Centre Officer, spoke briefly about their journey to becoming accessible at the Victorian Tourism Summit in August 2013. Following that she received a number of enquiries from other Visitor Information Centres asking how they could become accessible. She has since been asked to present on becoming accessible at the next Victorian Tourism Summit in 2014. In November 2013 the Centre became communication accessible and now proudly displays the Communication Access Symbol making it the first Visitor Information Centre to do so. To become communication accessible the Centre worked in partnership with Zita Canning from the Peninsula & South East Regional Communication Service. Management completed the Self-Assessment Questionnaire to identify areas that needed to be improved to become communication accessible. Staff and volunteers attended a Listening and Learning to Communicate with Everyone (LACE) training session. This has improved customer service and staff confidence when interacting with people who have communication difficulties. Picture symbols were designed to extend the tourism symbol set already available. The Centre will be advocating to Victorian Tourism that the existing tourism symbol set be expanded and used consistently across the sector. 2 communication boards and an alphabet board were developed and produced. These are clearly displayed at the front desk and on the wall of the Centre. The physical layout of the Centre was improved by placing display stands, tables and shelves in a way that allows people to see everything without having to negotiate up and down aisles. Wheelchairs can now move freely through the Centre. 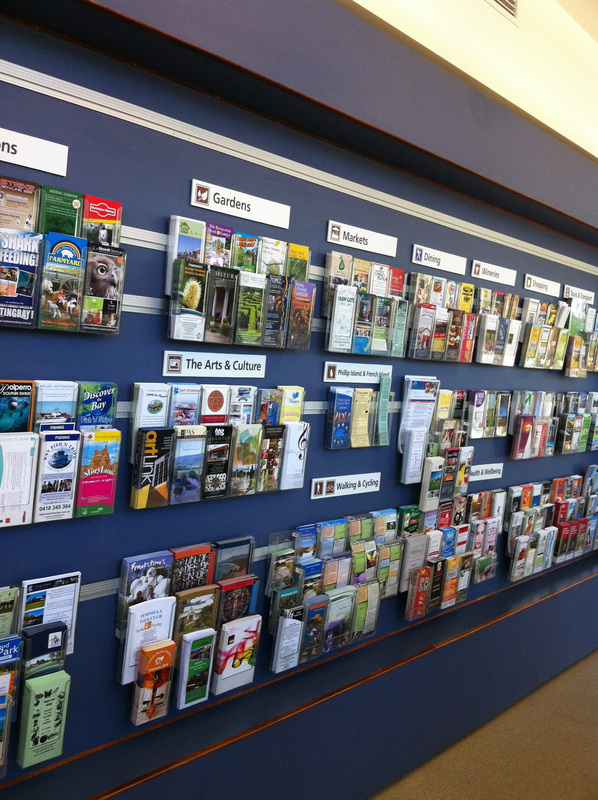 The pamphlet display was grouped into categories which are identified by a picture symbol. This enables people to scan for the category they are interested in and then see all the businesses in the region they can access. 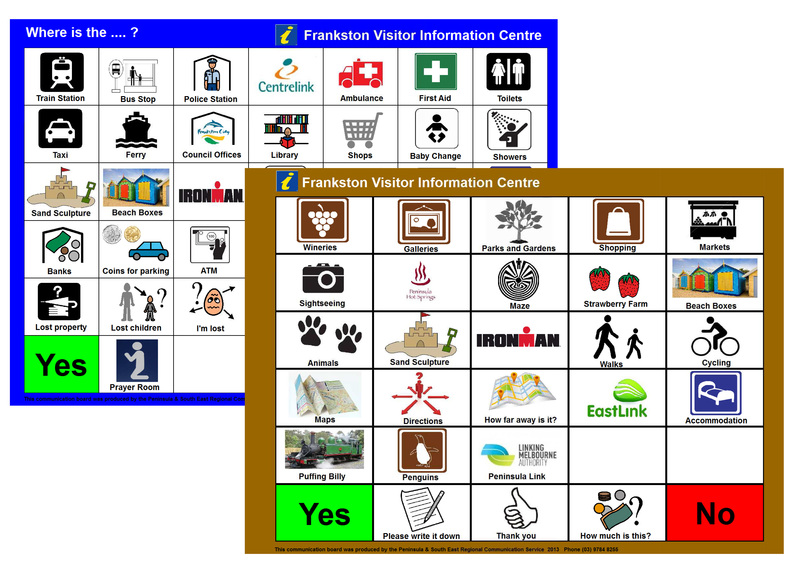 The staff and volunteers of the Frankston Visitor Information Centre reported that they had found the journey to becoming communication accessible an enjoyable and rewarding experience. The Centre plans to promote to members that they become communication accessible. This would include staff training and developing resources such as communication boards, picture menus and ‘easy to read’ pamphlets. This entry was posted in Uncategorized on August 19, 2014 by crcscope. Leisure Centres across the northern metropolitan region have continued to embrace communication access. In partnership with the North West Metro Regional Communication Service (NW RCS), several centres this year have been working on becoming more communication accessible for people with communication difficulties. WaterMarc is one leisure centre in Greensborough which have recently been working on creating a communication friendly environment. Working on sustainable systems e.g., staff induction packages to ensure all new staff access relevant information regarding this initiative. WaterMarc will soon be ready to undergo a ‘communication access assessment’ by a mystery shopper with communication difficulties, in order to apply to be awarded the Communication Access Symbol. Congratulations to these centres on the work they have done and on achieving the Communication Access Symbol! It’s a great time for a swim in the north! This entry was posted in Uncategorized on August 4, 2014 by crcscope.